← The Gospel of Free Salvation to All Men! The third Gospel is the Gospel of free salvation to all men. This corresponds to the two cardinal points in the doctrinal system of Paul: gratuitousness and universalness of salvation. It is eminently the Gospel of free salvation by grace through faith. Its motto is: Christ came to save sinners. “Saviour” and “salvation” are the most prominent ideas. Mary, anticipating the birth of her Son, rejoices in God her “Saviour” (Luke 1:47); and an angel announces to the shepherds of Bethlehem “good tidings of great joy which shall be to all the people “(2:10), namely, the birth of Jesus as the “Saviour” of men (not only as the Christ of the Jews). He is throughout represented as the merciful friend of sinners, as the healer of the sick, as the comforter of the broken-hearted, as the shepherd of the lost sheep. The parables peculiar to Luke—of the prodigal son, of the lost piece of money, of the publican in the temple, of the good Samaritan—exhibit this great truth which Paul so fully sets forth in his Epistles. The parable of the Pharisee and the publican plucks up self-righteousness by the root, and is the foundation of the doctrine of justification by faith. The paralytic and the woman that was a sinner received pardon by faith alone. Luke alone relates the prayer of Christ on the cross for his murderers, and the promise of paradise to the penitent robber, and he ends with a picture of the ascending Saviour lifting up his hands and blessing his disciples. The other Evangelists do not neglect this aspect of Christ; nothing can be more sweet and comforting than his invitation to sinners in Matthew 11, or his farewell to the disciples in John; but Luke dwells on it with peculiar delight. He is the painter of Christus Salvator and Christus Consolator. It is the Gospel of universal salvation. It is emphatically the Gospel for the Gentiles. Hence the genealogy of Christ is traced back not only to Abraham (as in Matthew), but to Adam, the son of God and the father of all men (Luke 3:38). Christ is the second Adam from heaven, the representative Head of redeemed humanity—an idea further developed by Paul. The infant Saviour is greeted by Simeon as a “Light for revelation to the Gentiles, and the glory of his people Israel” (2:32). The Baptist, in applying the prophecy of Isaiah concerning the voice in the wilderness (Isa. 40), adds the words (from Isa. 52:10): “All flesh shall see the salvation of God” (Luke 3:6). Luke alone records the mission of the Seventy Disciples who represent the Gentile nations, as the Twelve represent the twelve tribes of Israel. He alone mentions the mission of Elijah to the heathen widow in Sarepta, and the cleansing of Naaman the Syrian by Elisha (4:26, 27). He contrasts the gratitude of the leprous Samaritan with the ingratitude of the nine Jewish lepers (17:12–18). He selects discourses and parables, which exhibit God’s mercy to Samaritans and Gentiles. Yet there is no contradiction, for some of the strongest passages which exhibit Christ’s mercy to the Gentiles and humble the Jewish pride are found in Matthew, the Jewish Evangelist. The assertion that the third Gospel is a glorification of the Gentile (Pauline) apostolate, and a covert attack on the Twelve, especially Peter, is a pure fiction of modern hypercriticism. It is the Gospel of the genuine and full humanity of Christ. It gives us the key-note for the construction of a real history of Jesus from infancy to boyhood and manhood. Luke represents him as the purest and fairest among the children of men, who became like unto us in all things except sin and error. He follows him through the stages of his growth. He alone tells us that the child Jesus “grew and waxed strong,” not only physically, but also in “wisdom” (Luke 2:40); he alone reports the remarkable scene in the temple, informing us that Jesus, when twelve years old, sat as a learner “in the midst of the doctors, both hearing them and asking questions;” and that, even after that time, He “advanced in wisdom and stature, and in favor with God and men” (2:46, 52). All the Synoptists narrate the temptation in the wilderness, and Mark adds horror to the scene by the remark that Christ was “with the wild beasts” (Mark 1:12, meta; tw’n qhrivwn); but Luke has the peculiar notice that the devil departed from Jesus only “for a season.” He alone mentions the tears of Jesus over Jerusalem, and “the bloody sweat” and the strengthening angel in the agony of Gethsemane. As he brings out the gradual growth of Jesus, and the progress of the gospel from Nazareth to Capernaum, from Capernaum to Jerusalem, so afterwards, in the Acts, he traces the growth of the church from Jerusalem to Antioch, from Antioch to Ephesus and Corinth, from Greece to Rome. His is the Gospel of historical development. To him we are indebted for nearly all the hints that link the gospel facts with the contemporary history of the world. It is the Gospel of universal humanity. It breathes the genuine spirit of charity, liberty, equality, which emanate from the Saviour of mankind, but are so often counterfeited by his great antagonist, the devil. It touches the tenderest chords of human sympathy. It delights in recording Christ’s love and compassion for the sick, the lowly, the despised, even the harlot and the prodigal. It mentions the beatitudes pronounced on the poor and the hungry, his invitation to the maimed, the halt, and the blind, his prayer on the cross for pardon of the wicked murderers, his promise to the dying robber. It rebukes the spirit of bigotry and intolerance of the Jews against Samaritans, in the parable of the good Samaritan. It reminds the Sons of Thunder when they were about to call fire from heaven upon a Samaritan village that He came not to destroy but to save. It tells us that “he who is not against Christ is for Christ,” no matter what sectarian or unsectarian name he may bear. It is the Gospel for woman. It weaves the purest types of womanhood into the gospel story: Elizabeth, who saluted the Saviour before his birth; the Virgin, whom all generations call blessed; the aged prophetess Anna, who departed not from the temple; Martha, the busy, hospitable housekeeper, with her quiet, contemplative sister Mary of Bethany; and that noble band of female disciples who ministered of their substance to the temporal wants of the Son of God and his apostles. It is the Gospel for children, and all who are of a childlike spirit. It sheds a sacred halo and celestial charm over infancy, as perpetuating the paradise of innocence in a sinful world. It alone relates the birth and growth of John, the particulars of the birth of Christ, his circumcision and presentation in the temple, his obedience to parents, his growth from infancy to boyhood, from boyhood to manhood. Luke 1 – 2 will always be the favorite chapters for children and all who delight to gather around the manger of Bethlehem and to rejoice with shepherds on the field and angels in heaven. It is the Gospel of poetry. We mean the poetry of religion, the poetry of worship, the poetry of prayer and thanksgiving, a poetry resting not on fiction, but on facts and eternal truth. In such poetry there is more truth than in every-day prose. The whole book is full of dramatic vivacity and interest. It begins and ends with thanksgiving and praise. Luke 1–2 are overflowing with festive joy and gladness; they are a paradise of fragrant flowers, and the air is resonant with the sweet melodies of Hebrew psalmody and Christian hymnody. The Salute of Elizabeth (“Ave Maria”), the “Magnificat” of Mary, the “Benedictus” of Zacharias, the “Gloria in Excelsis” of the Angels, the “Nunc Dimittis” of Simeon, sound from generation to generation in every tongue, and are a perpetual inspiration for new hymns of praise to the glory of Christ. 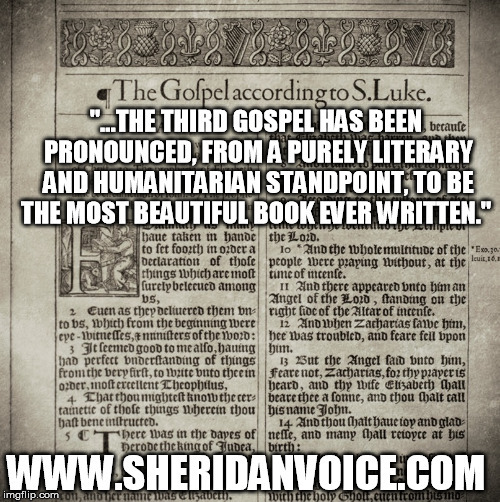 No wonder that the third Gospel has been pronounced, from a purely literary and humanitarian standpoint, to be the most beautiful book ever written.